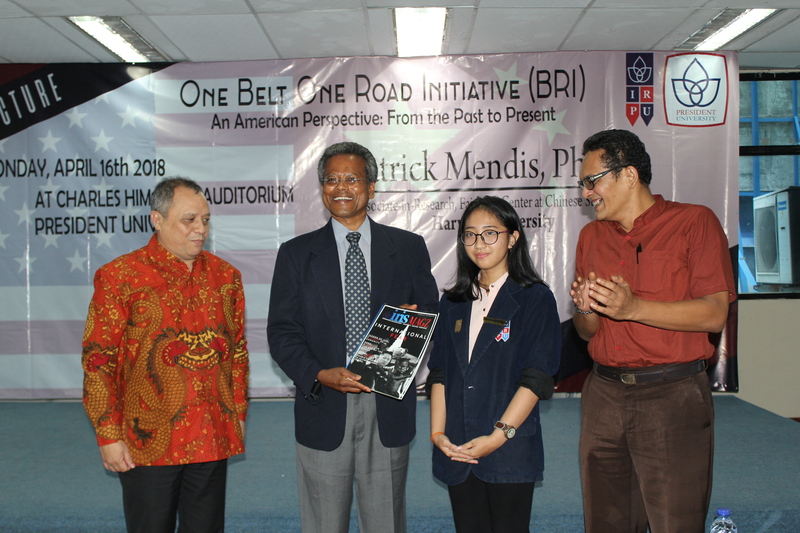 General Lecture Series “One Belt One Road Initiative: An American Perspective: From the Past to Present ” by Mr. Patrick Mendis, Ph.D.
IRPRESUNIV.ORG, CIKARANG ̶ Friday (16/4), the International Relations Study Program of President University conducted a General Lecture with the theme of “One Belt One Road Initiative: An American Perspective: From the Past to Present ” delivered by Mr. Patrick Mendis, Ph.D., Associate-in- Research for Fairbank Center for Chinese Studies, Harvard University. The General Lecture series opened by the opening remarks by the Dean of Faculty of Humanities of President University, Drs. Teuku Rezasyah, Ph.D., and continued with the presentation from Mr. At first Mr. Patrick Mendis explained the history of creation of America, pointing out that the nation was created based on a rebellion to tackle down the British colonial. Mr.Patrick continued by explaining that the US Constitution was meant to regulate commerce with foreign nations, and among the several states, and with the Indian tribes. Mr.Patrick explained further the topic by addressing the relationship between China, as he mentioned that even before the modern era, one of US President, Benjamin Franklin quoted that “Chinese are regarded as an ancient and highly civilized nation”, this shows a long real relationship between these 2 countries. Later on Mr.Patrick mentioned things such as the Westward Journey: the Pacific “Railroad” Civilizations as the trade and commerce route of the US, The Great Rejuvenation of the Chinese Nation of President Xi Jinping is based on Ambassador Zhang Qian’s trade route to the West during the Han Dynasty to explained how and what is actually The One belt One Road Program. Mr. Patrick believed that China reviving the Celestial Empire as Journey to the West (Ground Silk Road of the Tang Dinasty) and Zheng He’s Western Ocean (Ocean Silk Road of the Ming Dinasty) is the evidences that China is currently trying to revive The Silk Road, a long program that was meant long time ago. Mr Patrick further explained President Donald Trump’s statement on “Make America Great Again” influence the US’ foreign policy of Shared Interests with China, which also leaving a few things not running in-line. Mr. Patrick conclude in the way how the American should address the Silk Road by balancing its founding vision’s ideas on morality and commerce in order to “Make America Great Again”.